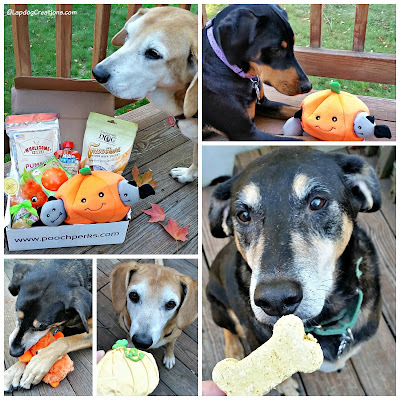 Disclosure: Pooch Perks sent an October box to Lapdog Creations, free of charge, for review purposes. We only share information that we feel is relevant to our readers, and all opinions expressed are our own. If you click on our affiliate links and subscribe, I may receive a few pennies to help maintain this blog. 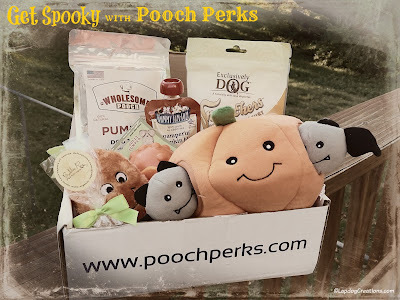 If you've been following us for awhile, you already know how much the Lapdogs wag their tails for Pooch Perks Inc. - and October was certainly no exception! This month's theme is Dive Into Our Pumpkin Patch, and it couldn't have been more perfect. The selection of toys and treats was just what the Lapdogs needed to get in the Halloween spirit. These all natural, tasty treats are free of wheat, corn & soy, and made in Irvine, CA. The Lapdogs give them all paws up! A super cute, no-stuffing, squeaky toy... and boy does it squeak loud! Penny is currently obsessed with the adorable orange guy. Made with just 3 organic ingredients, this little squeeze packet is full of healthy, tasty goodness. We used ours as a food topper. We love interactive dog puzzles and this one just might be the cutest ever! There are 3 little bats to stuff inside Mr. Pumpkin for hours of hide-and-seek fun. Made with cage-free eggs, natural peanut butter and wildflower honey, this treat smelled good enough for the humans to eat... but we didn't. These chewy, all natural morsels make excellent rewards for good behavior. It floats, it dispenses treats, and it has an erratic bounce that provides hours of entertainment for your dog - and it's bright orange!. As always, this month's box was a huge hit. The toys have kept the Lapdogs occupied, and they've been doing lots of tricks for their new tasty pumpkin treats. 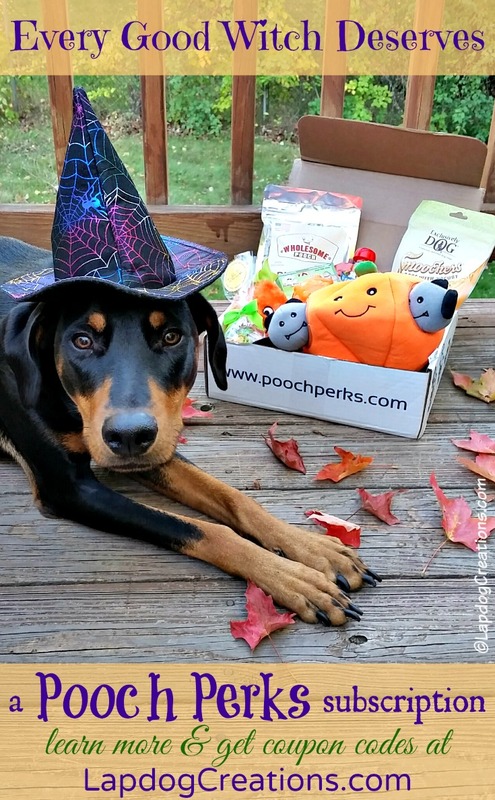 Signing your pooch up to get her very own monthly box of goodies is as easy as 1-2-3! 6 items, approx. retail value $60 - October's box had 7 items! While Pooch Perks Inc. does not offer a multi-month price break, you can SAVE 10% off at any time with coupon code LAPDOG *** OR *** for a limited time, you can save 15% off when you click on the affiliate links in this post and use code PUMPKINPATCH! Oh this is adorable, what a great Halloween treat! I'm sure the dogs will love all these goodies. Enjoy! Oh, this pet parent loves pumpkin too! That box looks great! What a GREAT looking pooch box! I really need to start getting this for our Lyla! Bats make a lot more sense for the theme than seeds but I didn't see their wings on instagram. 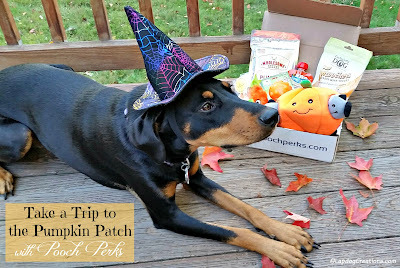 My dogs love pumpkin, so they would have been very happy with this month's box. I think the monthly treat boxes are such a great idea, and they make a great gift for someone who just welcomed a new dog into the family. It will help them build up their collection of treats and toys, without costing a lot. Looks like a great collection of stuff. I'm a big fan of all things pumpkin. Love the name Bubba Rose biscuit! Does PoochPerks have an option for multidog households? This sounds like a great subscription box. If all the toys were made in the US, I think I would take the plunge. Wow! This box is chock full of goodies! I like the theme too! I havent tried Bubba Rose but have heard great things about that company! 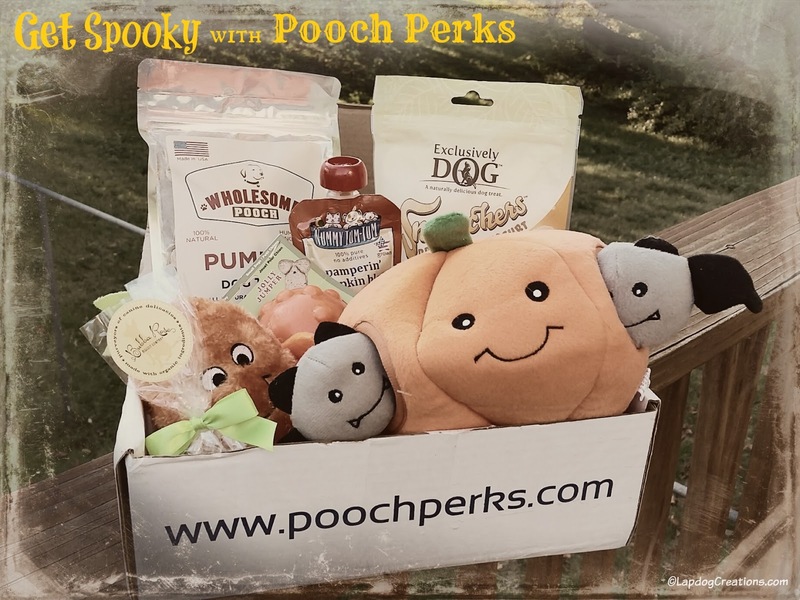 These subscription boxes look a good buy AND also a lot of fun for the pet parent. I would always look forward to the box every month. I know the cat lady box people seem to. NZ is so far away we get so little opportunity as the shipping can be steep which is a real shame. ooh I think Kilo the Pug would love that box too. He loves pumpkin, puzzles, toys and treats so it sounded like the perfect combo. Love subscription boxes for pets, but can't afford it right now. I'm a big Halloween lover. This box of goodies is just perfect for the season! I love the big pumpkin toy. :) I hope the dogs had a ton of fun with all of their new festive toys and treats. What a wonderful box! We love Autumn and pumpkin and this just looks like a huge hit! Thanks for the great review! What a fun collection of stuff to get ready for fal! I love all the toys in this month's box! I'm sure the pups are still enjoying everything.